Quickly pinpoint student proficiency levels and instructional needs across a range of subjects with instant test results, personalized to each student, that ensure correct overall student placement. Administered over time, Performance Series provides a longitudinal view of student growth in core curriculum areas (English Language Arts, Mathematics, and Science). Scantron’s two-part solution combines this research-based, content-rich computer adaptive test known as Performance Series and a content-neutral, highly flexible testing product known as Achievement Series®. Educators love using this combination to develop and administer online and paper-based tests. It’s the complete package. No test creation needed—all tests and items are predefined and backed by decades of research and a rigorous development process designed and implemented by Scantron’s content experts. We maintain the tests continuously, adding new items, removing stale content, and aligning items to evolving state and other educational standards. Limited setup necessary—once student data is imported, students simply log in from an internet enabled device (PC, Mac, iPad, Kindle, Chromebook, with Android coming soon), select the subject area, and begin testing. With Performance Series, students take individualized tests that automatically adjust to each student’s ability level. Struggling students are supported with questions they can answer, reducing their frustration. High-achieving students are challenged with more difficult items, increasing their engagement. The result is a more accurate understanding of student knowledge across the classroom. With Performance Series, you get much more than a single score. Teachers, committees, administrators, students, and parents all see results that help answer their questions. 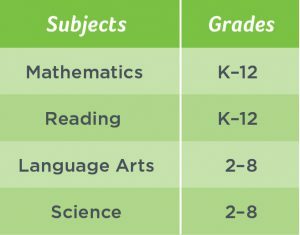 Adding Scantron Analytics makes it easy to see your growth and benchmark results in context with other crucial student data such as attendance, discipline, grades, and other assessments. Trends and patterns emerge, enabling you to design interventions and remediation to accelerate student growth.